In the emerging era of wide spread use of IT tools, up-to-date information on water resources is the key to support economic development, conserve the nature as well as to improve the quality of life. Due to rapid rise in population and food demand, growing economy and improving living standards; the pressure on our water resources is increasing and it will become scarce in the coming decades if not managed at this stage in integrated way. Water resources management requires a multi-disciplinary approach that combines a collection of technical tools and expertise along with stakeholders of diverse interests and priorities in planning and management and an operational water resources information system at national level is the first requirement. With the emerging knowledge society and wide spread use to Information Technology, up-to-date information on water resources is vital to support economic development, improve the quality of life as well as to conserve the nature and the environment and hence; an operational water resources information system at national level is essential for planning and development of the country. Looking at this CWC and ISRO are jointly executing since January 2009; the project ‘Generation of database and implementation of web enabled water resources information system of India’ short named as India-WRIS WebGIS. ‘Single Window’ solution of all water resources & related data and information in a standardized GIS format to all concerned departments, organizations and stakeholders. 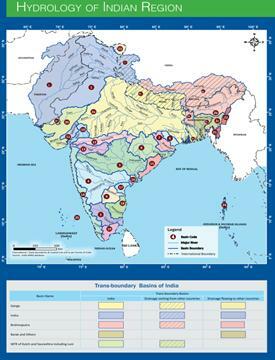 The thin client scalable web enabled information system provides comprehensive, authoritative and consistent data of India's water resources along with allied natural resources data & information, web enabled tools to search, access, visualize, understand, look into context and study the spatial patterns. Based on the requirements and data availability, comprehensive information have been collected, thought fully categorized and arranged in GIS environment under 12 major and 30 sub information systems besides base sub information system having large number of attributes data of last 5 – 50 years. 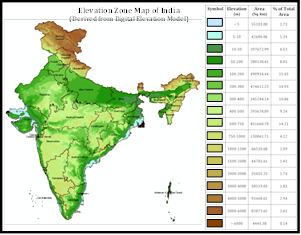 India-WRIS Web GIS has been designed using latest web 2.0 technologies which provide various GIS tools in a rich GUI assisted format for easy access and use. The current version 3.0 of the WebGIS portal is designed and developed keeping in view multi- users from all sections of society, varied and multi-source data input, current map policy, requirement of regular updates and near real time data accessibility, data security domains, scale of information and level of access of the portal as well as download of different GIS maps, data and value added products along with tool kit for further analysis and value addition. Dissemination of data in public domain constitute the most important aspects of the water resources management being multi stakeholder’s involvement, people’s participation and information sharing to increase transparency, public awareness, elevating the importance of water information and enlighten public involvement in water management. The thrust has been towards development of an open source user end web enabled information system. It provides adequate and contemporary information on the state of water resources which are must for planning and water resources management strategy. This, in turn, will ensure increase in public awareness about the crucial issues related with water and attract their participation in management, planning and development of water resources of the nation leading towards the holistic goal of water security. Water is one of the most important renewable natural resources for supporting life. With the increasing population of India as well as its all-round development, the utilization of water is also increasing at a fast pace. 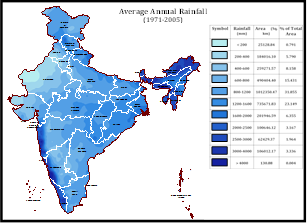 On an average, India receives annual precipitation (including snowfall) of about 4000 km3. However, there exist considerable spatial and temporal variations in the distribution of rainfall and hence in availability of water in time and space across the country. It is estimated that out of the 4000 km3 water, 1869 km3 is Average annual potential flow in rivers available as water resource. Out of this total available water resource, only 1123 km3 is utilizable (690 km3 from surface water resources and 433 km3 from ground water resources). Range Rainy days 5-150, most rain 15 days in 100 hrs. Database Design & Generation: The database for India-WRIS is highly complex with numerous sources involved. Much of the data is spatial in nature but the amount of associated data is very large and also having time series, and will further increase exponentially with the passage of time. The creation and management of such data is a colossal feat in itself and requires state of the art tools. The database standards and relationship have been developed for all type of data. The database generation software used have the capabilities of creating maps, viewing or exploring data, editing data, storing, conflation (integrating datasets from different sources), transforming (into different coordinates systems, different representations, re-sampling, resulting in new representation/format of the same data), querying, analyzing etc. Web Application & User Interface Technology: The major user requirement from the web portal is data dissemination; hence advance GIS data processing systems at the back end augmented with the best database connectivity over the internet is used so that the user is able to get intuitive and real time information. 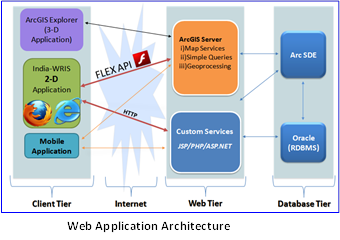 Using the Flex API, India-WRIS combines GIS based Web services from ArcGIS Server with other Web content, which are displayed in simple, dynamic mapping applications over the Web. All the published map services are compliant with OGC standards and the services can be accessed using WMS, WFS, WCS and KML standard formats. ArcSDE as well as oracle together used to handle geospatial data and to createmultiuser geo-database. 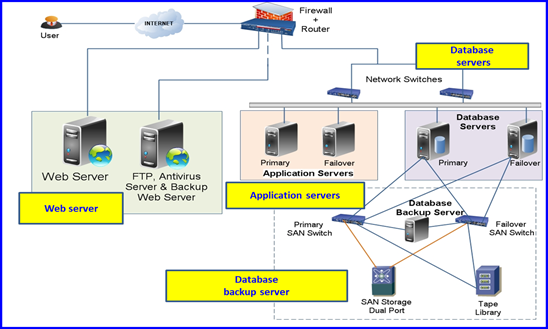 Database Storage & Hosting: In order to ensure reliable and secure, 24 x 7 availability of the WebGIS, a robust hosting architecture has been designed. The same has been replicated at three places namely, RRSC (West) - Jodhpur, the data generation and s/w development as lead centre; NRSC - Hyderabad for web hosting and CWC - New Delhi for intranet users and data validation & updation. Considering large number of factors as; type and volume of data, large number of varied users, ease of handling, varied nature of internet connectivity in the country, information requirement by the users and available technologies; Utmost care has been taken by the WRIS team to design the user interface of the portal. The main menu has six modules namely, WRIS Info Discovery, WRIS Explorer, WRIS Connect, Input Data Builder, Share Success Story and Create Your WRIS.This is the heart of India-WRIS information system where all the major links to the various WebGIS modules are provided in a rich Graphical User Interface (GUI) assisted format for easy access and use. 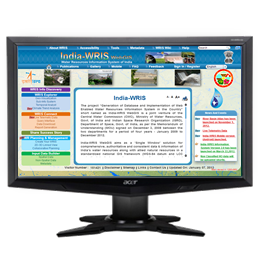 WRIS Info Discovery & Data Catalog - This module provides the user to select area of interest based on the Administrative units, Hydrological units and Constituency wise and is presented with a condensed list of all the information available in India-WRIS for the area. Geo-Visualization - This section provides basic facility to visualize all the layers together in any combination by turning layers on and off as per the requirements. Sub-Information Systems- There are 12 major information systems namely, base data, surface water, ground water, hydro-met, water quality, snow cover/glacier, inland navigation waterways, inter-basin transfer links, hydro-met extremes, land resources, water tourism and socio-economic. These have been further divided into 35 sub-information systems. Each sub-information system is based on a particular theme. It contains relevant layers and specially created tools to make the best use of the data. Temporal Analyst - A large amount of water resources and related data regarding hydrological, meteorological, pollution etc. are temporal in nature. In order to represent these datasets, a separate module has been created where facilities are provided to represent the time series data using suitable charts, animations and to compare the data across stations or years. Climate Trend Analysis – The aim of this section is to provide the users with a facility to analyze the changes in climate over the course of past 104 years (1900-2004). This analysis can be performed on various units viz. River Basin, State, District, and Village through various tools such as tabular, statistical and graphical analysis. Live Telemetry Data - This system provides real time information such as Water Level, Rainfall, Air Temperature, Wind Speed, Wind Direction and Solar Radiation measured at 466 telemetry stations across the country. Water level data for the past 72 hours is displayed where as the other parameters of the past hour are presented on a dashboard. Query Interface - User can have lot of queries answered directly through WRIS Explorer and associated available tools. To explore more details, user can place queries through Query Interface that contains set of fixed queries on various hydrological parameters. The answers are generated through different permutations and combinations of these fixed queries. The result of a query is displayed in spatial as well as non-spatial formats. Report Generation - This section has the utility to automatically generate report of the user defined area / region containing the all data into tables and maps and allows Save As and Download in .pdf format. Data Download - Apart from viewing the available data, the user may also wish to take the data and perform analysis / add value. This link allows the download of GIS layers and associated attributes. Automatic Map Generation – This module provides the user with a highly useful facility of generating high-quality, multi layered, theme based maps in GeoPDF format. The latest GeoPDF documents are highly versatile PDF documents that have the features of a mini Geographic Information System complete with tools such as layer visibility toggling and attribute data viewing. This module aims at keeping the data content of the various layers of India-WRIS up to date by providing facilities to the data providing sources to ingest the current attribute data directly into the relevant layers. The authorized users can enter the respective spatial and non-spatial data in the specified format into the information system through this facility. The three sub-modules of Input Data Builder are Spatial, Non-spatial and Metadata Input Builder. The objective of this module is to connect people for water resources planning and management by providing platform to upload the success stories so that others can view, interact and practice. Create Your WRIS- This module provides facilities to the user to have further analysis of the downloaded data, adding new datasets using available general hydrology tools and generate report of the area. 2D-3D Linked View – Through this highly interactive feature, 3D fly-through simulations can be generated along any linear feature like Rivers, Roads or user drawn features. The high resolution satellite imagery make it a very realistic flying experience. Collaborative Planning – In the water resources sector, need is often felt to share and work collaboratively for understanding and decision making. This tool provides the platform for this purpose wherein the users can share their screen views, drawing & actions while communicating through text and voice messages. Universal toolbar is present at the top of the home page and has two sections. First section - The toolbar at the top of the page contains the links to popup window having information required by the user at any point and toolbar is visible at all times. The links in this toolbar are: About WRIS; Accessibility; Tools; Metadata; WRIS Wiki; Help; Search . Second section - The advanced information toolbar is available right below the banner. It contains links to pages containing detailed information that a user requires when visiting the home page but may not require while exploring the other sections of the information system. The links available in this toolbar are: Home; Publications; Gallery; WRIS Mobile; FAQ; Feedback; Sign In / Register. This toolbar is available in the lower section of the home page and provides links to general information about India-WRIS as Visitor Number, Disclaimer, Sitemap, Links, Contact Us and Last Updated. Zoom In: It zoom into a particular area on map that is selected by the user. Zoom Out: Is zooms-out the map to come out of the detailing. Full Extent: It allows viewing the map at the full extent. Previous Extent: It allows going to previous extent when the map extent is changed. Next Extent: It allows returning from the previous extent. Map Overview: Provides location of current view in context with larger map area. Print: To print the current viewing area in landscape or portrait mode. Bookmark: Allows bookmarking a specific location on the map for future reference. Network Analysis/Route Tool: It specifies the defined route of road, rail and river network. Tools to calculate parameters based on location and user input. Linked View: Can View multiple view of different information in a single window. Share a Link: Share the current view of map with another user through mail. iFrame: Sharing frame of India-WRIS in other applications. The hydrological processes are continuous as well as somewhat complex and therefore, an updated comprehensive, reliable and easily accessible Information System having time series data of the hydrological and meteorological observations is pre-requisite for effective management of water resources.